Today you're getting a list of the best weed grinders on the market. These grinders are THE go-to grinders if you want to build up kief. A 4-piece grinder has a special screen at the bottom of it. All the little crystals and trichomes that fall through while you're grinding, get caught in this screen. Over time, this kief will build up nicely, and you will have an extremely potent herbal bland at your disposal. You can sprinkle kief over your weed to give it some extra potency for example. Or vape it/smoke it all by itself (be careful though this will be extremely potent and hard-hitting). Because of their size, 4-piece grinders are not the best choice if you have portability as a high priority. Keeping this in mind, let's start with our best 4-piece weed grinder. Doesn't grind fine enough for 100% conduction vapes. 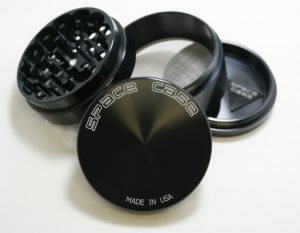 Space Case is one of those heavyweight brands in the weed grinder world. Space Case grinders will last you for 10+ years, without degrading in performance or any materials/coatings coming off, like you get with so many cheaper grinders. The build-quality of Space Case grinders is unparalleled. Performance-wise, this weed grinder tears through the hardest nugs with minimal effort every time. This weed grinder is our top pick if you’re looking for the easiest and most consistent grind. First, you don't need to be grinding for a long time to get the same grind-consistency with all of your herb. Second, it's very easy to get the exact same grind consistency every time you grind. It’s also unquestionably the best grinder for catching kief. The kief build-up with this grinder after only 10-15 grinds is already so much, you will feel obliged to start using your kief. Don't you hate it when you pull out your grinder, see all the resin and dirt between the grinding teeth, and quickly realize that you can't grind yet, but need to clean first. Nothing sticks to this grinder, your herb will slide off the grinding teeth like soft butter slides off a knife. If you’re looking for a really fine grind (for conduction vapes mostly), you’re going to have to go for a proper 2-piece grinder. For anything else than 100% conduction vapes, this 4-piece Space Case Grinder will be perfect. It's our TOP pick of all 4-piece grinders. 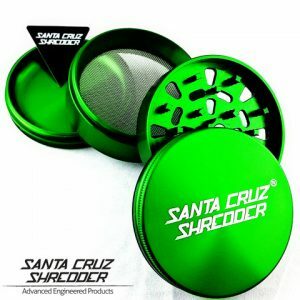 The Santa Cruz Shredder is also known as the ‘medical-grade’ weed grinder and has quite the history and reputation of being one of the highest quality weed grinders you can get. It’s extremely reliable, durable and scratch-resistant. All these features make the Santa Cruz Shredder the best pick for anyone that’s obsessive about health or safety. It’s also the only grinder that really ‘shreds’ your weed instead of grinding it. What this means is that your herb will come out ‘fluffy’ and with a certain amount of volume keeping most trichomes on your herb. This fluffy grind is GREAT for pure convection vapes like the Firefly 2 or VapeXhale Cloud EVO. Although a large 4-piece grinder usually means there’s a lot of kief build-up, the Santa Cruz Shredder does fall short in this area when you compare it to the 4-piece Space Case Grinders. Its size is big enough to grind any amount of weed of any type with minimal effort. 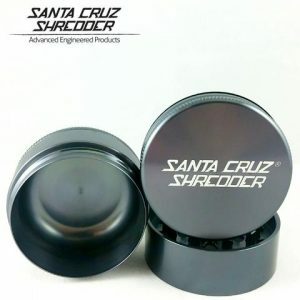 I highly recommend Santa Cruz Shredders, and they're my favorite grinders because I mostly use convection vaporizers and like fluffy grinds in general. There seems to be an inconsistency in the quality of SharpStone grinders. Does produce very high-quality weed grinders for a very affordable price. There are a lot inauthentic Sharpstone grinders in circulation…plus some Sharpstone grinders seem to last longer than others (inconsistent quality). However, if you do get the real deal, which is also of good quality, these grinders will last you a LONG time (5+ years). So if you’re looking for a very high-quality weed grinder to catch a bunch of kief that’s cheaper than the Santa Cruz and Space Case Grinders, check out the 4-piece grinders of Sharpstone. 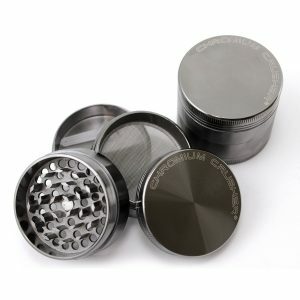 If you're looking for the cheapest 4-piece grinder, the Chromium Crusher is the cheapest you should go. This grinder is cheap but of a good enough quality for most of you. But, 2-3 years, if you treat it well. It’s made from high-quality zinc-aluminum alloy and is the heaviest grinders of all the grinders in the list. It's incredibly sturdy though and can take a severe beating. One thing that could be better with this grinder is the catching of kief. The kief screen is really fine, so you barely will get any. Also, there seem to be scratches and imperfections on the inside, which could make you wonder about the safety of this grinder. Herb pieces can get stuck around the edges of the grinding chamber. Over time, this builds up and results in an inconvenient ‘cleaning' session. This grinder isn't perfect and does have some downsides, but for its price, you won't find anything better. A 2-piece grinder is the simplest of them all. You just have a top-piece and a bottom-piece which rotate against each other. 2-piece grinders are actually my favorite grinders because they’re easy to use, compact, small and portable. 3-piece grinders have a compartment to catch the finer parts of your bud, but not kief. You could also store any bud that you didn’t use after your grind in this compartment. This can be great for portability purposes since easily being able to store some extra herb is always a plus. Overall, both 2- and 3-piece grinders are practical, easy to use and quite a bit cheaper than 4-piece grinders. Easier to use than 4-piece grinders. Gives a fluffy grind, which is especially good for convection vapes (and I love it for blunts/joints too). But the 4-piece Santa Cruz Shredders are expensive. Luckily the 3- and 2-piece versions are much more affordable. They just don't catch any kief. This doesn’t necessarily have to be a con for everyone. I don’t need a kief catcher, and I like 2- or 3-piece grinders since you can immediately brush out the kief out of 2-piece grinders. Also, they’re just more compact, and especially with the small 2-piece grinders you can get a very fine grind (if you grind upside down). The Space Case 2-Piece Grinder does grind finer than the Santa Cruz Shredder. However, no grinder is better if you're into fluffy grinds, keeping a certain amount of volume and most of the trichomes on your herb (like you would want with convection vapes). I also like a fluffy grind for blunts and joints, but the type of grind for blunts and joints is personal. If you want a fluffy grind or want the ‘safest' grinder, but don't need to catch kief, the 2- or 3-piece Santa Cruz Shredder is the grinder you should get. Hard to get a fluffy grind. 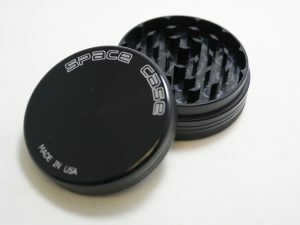 The Space Case 2-piece grinders, performance-wise are the best 2-piece grinders you can get. Just like the Santa Cruz Shredders, they’re extremely reliable and durable (they last up to 10+ years). If you're looking for something portable, you probably don't want to be messing around with annoying cleaning sessions. Well, this beast of a grinder needs no cleaning. It's also the best 2-piece grinder to get a fine grind with, for if you have a conduction vape or you just like rolling compact and fully packed joints. This Cali Crusher 2-piece grinder is a ‘good' grinder. But it doesn't get any more than ‘good'. Because its quality lags behind the Space Case Grinders or Santa Cruz Shredders. 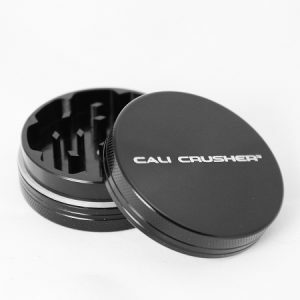 The 2-piece Space Grinders are just more consistent and can grind finer than this 2-piece Cali Crusher, plus have better build quality. And the Santa Cruz Shredder just really has its own style of grind: the characteristic fluffy grind, which is very hard to achieve with a Cali Crusher. These grinders are cheaper than the average grinder and they are still better than most grinders on the market. Thre MFLB Finishing Grinder is THE go-to grinder if you have a conduction vaporizer like the PAX 2, PAX 3 or MFLB. 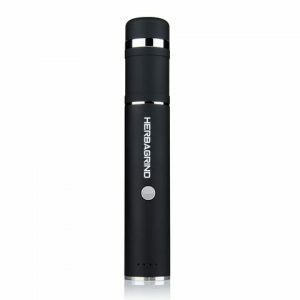 It grates your herb into a super-fine powder which is perfect for conduction vapes. The only downside is that you will have to pre-grind your herb. It just has a hard time cutting your herb up when you put whole nugs into it. But as a finishing grinder for powder-fine grinds, it's the best you can get! If you hate the manual act of grinding your herb, an electric grinder will be a blessing to you. You just put in the herb, press a button and let the device do its work: it couldn't get more convenient than this. To provide you with an electric grinder which not only grinds your herb perfectly every time, but gives you the opportunity to choose the finesse/coarseness of your grind. And if you want a more fluffy grind with some volume (perfect for your convection vape), grind your herb for 3-5 seconds. The best part about this grinder? The top opening is perfect to load the ground herb into your vape or paper immediately. It really couldn't get more convenient than this: you will be saving time and effort with every grind. The only potential shortcoming with the Herbagrind is if you want to build kief. You can't do that with this device. This doesn't mean the kief gets lost. It just immediately comes out when you start emptying the grinding chamber. If you want to build kief, you'll need a 4-piece grinder. Also, the blades in it are so sharp and fast, that it's not the easiest task to get the same fluffy grind every time. If you want the best consistency and need a lot of ‘fluffiness' in your grind, the Santa Cruz Shredders do this better. But for convenience, an electric grinder like the Herbagrind can't be beat. Metal, aluminum or plastic micro-parts could very well be mixing up with your herb when you use these grinders for a longer period of time. What do I mean with low-end? There are a few low-end weed grinders which are perfectly safe though. They just will lag behind in performance and ease of use compared to the mid-range and high-end weed grinders. Aside from these 2, avoid them. 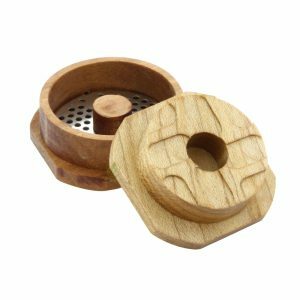 Different types of herb grinders serve different kinds of marijuana-lovers. Materials used in the grinder. 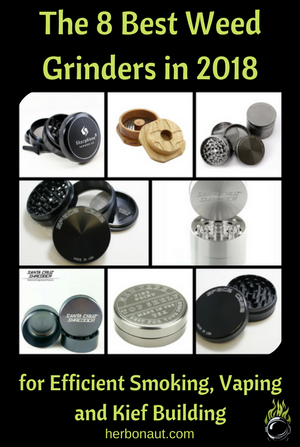 If you’re a complete weed grinder newbie this section will help you make an informed choice on what type of grinder will suit you best. These numbers and pieces refer to the number of pieces your grinder consists of. With 2-piece grinders, you just have a single compartment. Everything that comes off of your herb stays in this compartment. Usually with a 2-piece grinder, if you want the kief that comes off of your herb, you'll need a brush to brush it out. They're very easy to use, small, compact and the most practical and portable. With 3-piece grinders, you get an extra compartment to catch the finer parts of your bud (including parts that are coarser than kief). This extra compartment is also called the ‘storage' compartment since you can easily store a bunch of your herb in there. With 4-piece grinders, you get a 3rd compartment with a fine screen to catch and build up the kief that comes off of your herb. If you want to catch and build up your kief, go for a 4-piece grinder from our top list. Although small grinders are best for portability, if you have average hands you’ll have a much easier time grinding your marijuana with medium to large-sized weed grinders. …unless you always smoke/vape really small amounts (and if you smoke please do switch to vaping). Metal (usually aluminum) grinders are the highest quality grinders. But only when the aluminium used in it is high quality and anodized! Trust me; you don’t want that. Titanium is another very high-quality metal and my favorite material that a grinder can be made of. Because it requires little to no cleaning and just feels more premium. Wooden grinders are pretty rare these days. They are durable and sturdy. But for performance, we recommend anodized aluminum grinders. Wooden grinders sometimes absorb a significant amount of kief in their grains, meaning some of those precious and potent trichomes get lost. Acrylic grinders are the cheapest grinders around, but also the most prone to breaking. They’re also quite hard to clean since you can’t give them an ISO bath to easily scrape off clunked up herb particles and kief (you will damage the material with ISO alcohol). You learned what weed grinders are best overall. And what weed grinders are best per specific purpose. Although you do get what you pay for with weed grinders, maybe you don't need one of them. The most expensive weed grinders are 4-piece grinders. You only need these if you plan on catching and building up a lot of kief. But any weed grinder in this list will serve you well! If you enjoyed this post and wanted more, follow us on Instagram or become a fan on Facebook to stay up to date with our latest marijuana posts.